I have knitted a wash set I did the hand towel using Basket Rib Pattern I also did a Back Scrubber plus a face mitt which I was given the pattern for which is done on DP I cast on 40 stitches over 4 needles did a rib for 10 rows & then on dps 1 & 4 i did moss stitch & DPs 2 & 3 was knit until required length & put 1 & 4 on to one needle & 2 &3 on to another & cast off, i used 4.5mm for the rib & 3.5 for the body. Your wash set looks great! I love the pale yellow color. 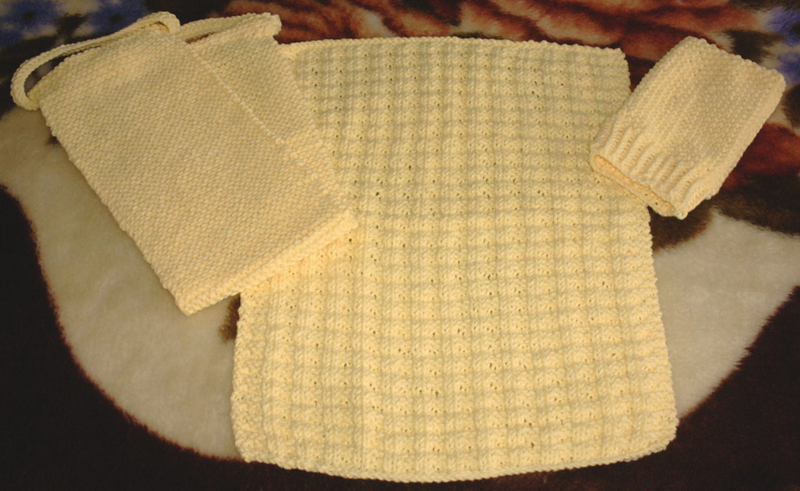 When I was growing up my Grandmother (who raised me) always had pale yellow wash cloths and towels in the bathroom. Yellow was her favorite color. I saw your site on Bluebird Quilts blog roll and thought I would have a look as I have started to knit socks and to my surprise you have a pair of socks just like I am knitting see my blog near yours on Bluebirds roll. Thanks now I know I am doing the pattern right as the first sock looks just like yours Thanks.